Is Death and Decay better or worse then Nightmares of Jigoku?? "Is Death and Decay better or worse then Nightmares of Jigoku??" They do very things in very different ways, both work very well though. Check the most recent errata in the downloads section for changes to Death & Decay. 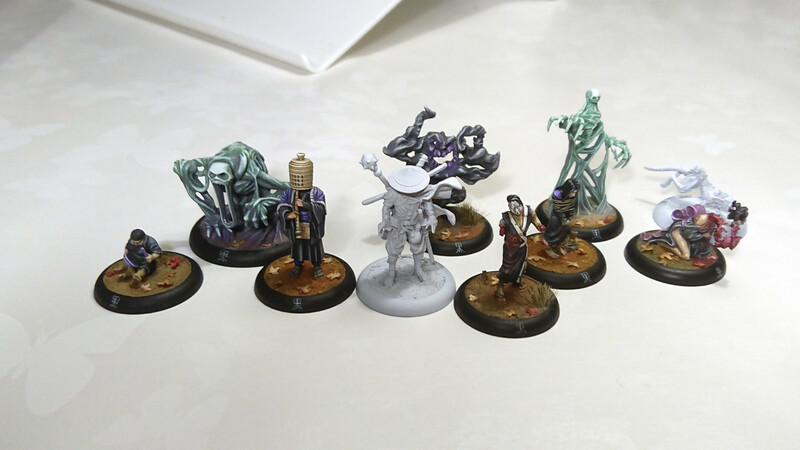 In my mind, the Cult is at its absolute best when played unthemed as you can bring toshiro (and makoto altough he isn't as game changing). My list has penny, taka, souta (altough orphan is probobly better) toshiro, mokoto, choking kami, kusatta kairai, plague Rat and some cards to fill up. I dare say the list is bordering on the broken side so i rarely play it. You can stack debuffs (like stun and aggressive) , negate the negativ effects from toshiro by engaging with your summoned ghosts, you have high fear, an absurd model count (10 with ghosts) and can counter just about anything the opponent does and use your ki feats to control their actions (like instill wrath, lure etc). One of very few drawbacks is the lack of sixth sense. You need to understand what your own models can do, there's the benefit of having some redundancy as well. Play it once, you will be amazed, play it often and you will find you're fresh out of friends to play with, haha. Sorry to ask , total noob here , but is Penny and Mokoto are Penanggalan and Molotov . And who can summum ghosts??? Yeah, penny is the pennangalan and I misspelled mokoti. He is the wicked monk with a basket on his head playing some sort of flute. He is awesome for his rice but can't go in either theme. Taka, souta and The orphan can all summon a sort ghost like kami (wrath, sloth, envy). Look asewome. Very different from what I was looking to play but condition heavy army that cripple your enemy to act normally is a be ry interesting play style. I own Taka already and alway love playing whit her when I use to play and love the thematic of those model. I regularly face different variants of a horde of kairai + Kato + Yugio + Rokuro + either Breath of Yurei or Desecrated Grave at my scene and I can tell you that it is a very viable. You will not be fast but you will be very hard to beat once you start tying down your opponents models. Death and Decay is very good swarming enemies, but does poorly in mobility heavy scenarios. I find Nightmares of Jigoku a nice all-rounder, but the lists tend to be particularly fragile. Once a model goes down, everything follows the same route like domino pieces.